For me, it's very rare that I'll order the exact same dish every time I go somewhere. Even rarer is that J and I will order the exact same dish so that we can't share and benefit from more variety. Ippudo is the exception. I've been coming here since 2008 when the wait for two on a Friday night was a gentle 20-30 mins at prime dinner time. Now, Friday night waits for two (well, first of all, I'd NEVER even attempt to go there on a Friday night now) are enough to make you look at the hostess like she had three heads and sulk out of there in search of plan B. 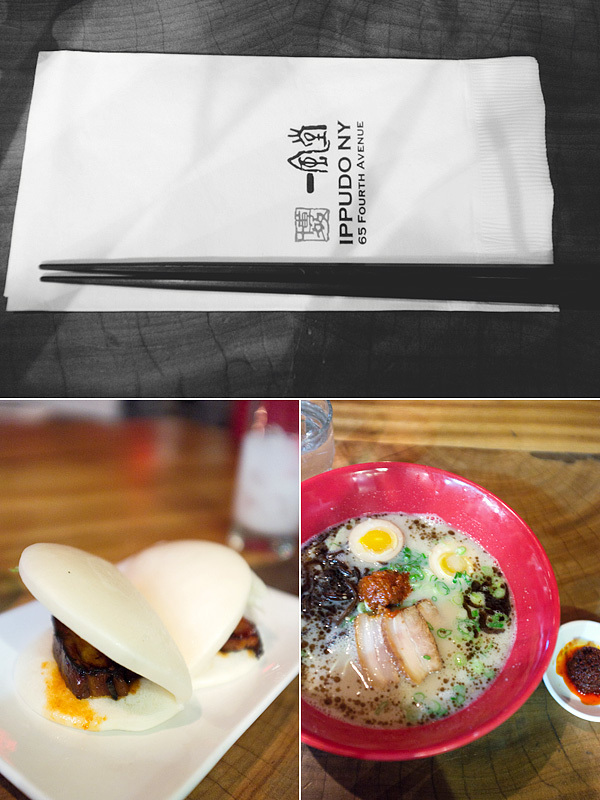 It is NO secret that Ippudo's ramen is the best in the city. And it's not like I haven't given other ramen joints a chance! Here's my message to all of you who haven't been here and plan on going at some point and to all of you who have been going and ordering the wrong things - I NEVER stray from this order: Hirata pork buns to start and the Akamaru Modern after that. I always always get the Akamaru Modern with the Nitamago (seasoned soft boiled egg) topping and a side of Bakudan (super spicy sauce to mix in). They've changed the sauce in the past year or so and now it's significantly spicier than it once was. It's $2 for the scoop, but I do wish I could ask for a 25 cent amount of it, which would be perfect. If you're more like J, you'll get the Akamaru Modern with the Kakuni (braised pork belly) topping. You can't go wrong with either of our choices. Now you know exactly what to order. The hard part is getting yourself in without the unbearable wait. ;) I'd recommend Sunday nights before last call - maybe 10pm or so, or Sunday mid afternoon around 3:30pm. Or of course you can show up right at opening lunch or dinner times during the week. Ugh. It's been so long since I've had that. I'm hungry now! It all looks so good. images are great. and that is a very strong recommendation for a menu item. must be so. Mouth is watering. Great review! I'll never forget what to order now! And I also can't believe I still have not been to Ippudo, likely due to the wait times mentioned above. Need to try asap. I always get the pork buns and Akamaru Modern too! That's mostly thanks to you.. though I don't think I knew you got the pork buns also. We walked out of a 2 hour wait last weekend and went somewhere else instead. I am still regretting it. Ippudo is originally from Fukuoka where I am from!